The Quick Settings are a clutch of popular Samsung Galaxy Tab features, each of which can be quickly accessed from the notifications pop-up. To see the Quick Settings, pop up the notifications list. Then touch the Settings icon button. The Quick Settings window appears. Airplane Mode/Flight Mode: Turns off the Tab’s wireless radios that are not allowed to be on during an airplane trip. Wi-Fi: Displays the Wireless & Networks, Wi-Fi Settings window. 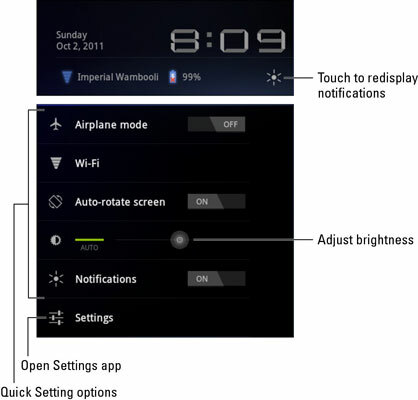 Auto-Rotate Screen: Enables the Tab’s ability to rotate and reorient the touchscreen based on which way you’re holding the Galaxy Tab. Brightness: Specifies how bright the touchscreen appears. Touch the word Auto to enable automatic brightness based on ambient light. Otherwise, drag the dot left or right to make the screen brighter or darker, respectively. Notifications: Turns on or off the notification icon display at the bottom of the touchscreen. The last item in the Quick Settings list is titled Settings. It’s not an on-off item, but rather a shortcut to the Settings app on the Apps Menu screen. You use the Settings app to control everything on the Galaxy Tab, not just the few items on the Quick Settings list.